Space Saving: Metro® platforms let you store bulky items off the floor in less space than if regular shelving were used. Neat & Sanitary: Cleaning is no problem since Metro™ platforms give you a 12" clearance from the floor on all four sides. You rarely have to move the platform to clean under it — a big help when it’s loaded with materials. Also, the open-wire construction provides air circulation and minimizes accumulation of dust and moisture on the platform. 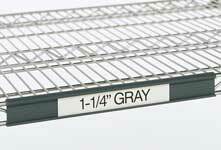 Sturdy: Super Erecta Shelf® posts and shelves mean fast, easy assembly and secure locking. A leveling bolt compensates for uneven floors. All platforms come with 13" posts. 3-1/2" deep basket with 400 lb. 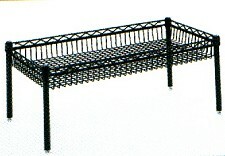 weight capacity for containing and displaying smaller items.